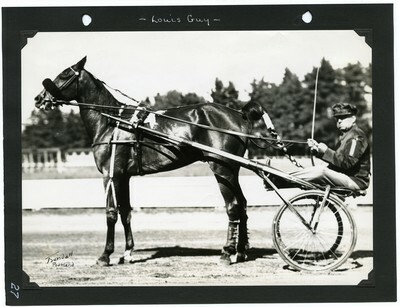 Black and white portrait of bay gelding Louis Guy, H. Brusie up in the Special Race trotting one mile at the Rochester Fair, Cold Spring Park, Rochester, N. H., Friday, September 28, 1934. Louis Guy finished the second heat of the race in first place with a time of 1.34 3/4. The photograph is signed in the lower left corner by photographer Guy Kendall.